Tunes are divided into phrases. Bass guitarists can recognize a phrase by listening to singers — they tend to take a breath between each phrase. Phrases are divided into measures (bars), and measures are divided into beats (or clicks of the metronome). In most tunes, four clicks of the metronome equal one measure, and four measures equal one phrase. In other words, a musical phrase is 16 beats long, or 16 clicks of the metronome. The organization of phrases makes it easier to keep your place in the music. To subdivide the phrases into smaller units, you need an understanding of rhythm and its notation. Check this out to hear the different duration of each note in comparison to the beat. 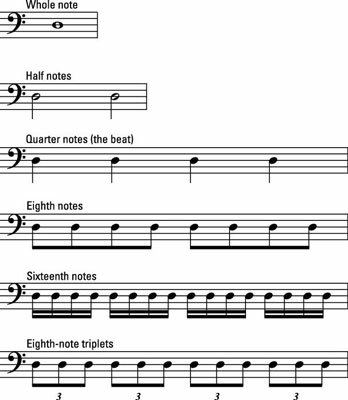 Whole notes are at 0:00; half notes at 0:11; quarter notes at 0:23; eighth notes at 0:35; sixteenth notes at 0:48; and eighth-note triplets at 1:00. Each of the four beats (metronome clicks) in a measure (or bar) equals a quarter note. These four beats make up the 1-2-3-4 of the musical count. Imagine that you’re marching on the street. Each of the four beats can in turn be divided into equal parts. To come up with interesting grooves and bass parts, you want to be able to divide a beat in several different ways. The eighth note is twice as fast as the quarter note. Imagine that you’re still marching — left, right, left, right. As you continue, tap your hand twice on your thigh, at regular intervals, for each step you take. Instead of counting 1-2-3- 4, subdivide the beat by adding an and at the end of each number, making it 1 and 2 and 3 and 4 and, evenly spaced. If you do this correctly, you’re still moving at exactly the same speed as before. Playing eighth notes on the bass works the same way as marching and tapping. Play two evenly spaced notes on your bass to each click of the metronome. Concentrate on keeping the notes evenly spaced — one note on the click and the other note halfway between the clicks. The sixteenth note is twice as fast as the eighth note, and four times as fast as the quarter note. Imagine that you’re still marching and counting 1 and 2 and 3 and 4 and. Without changing your pace, tap your hand twice as fast as before. You’re now tapping four times for each step. This is the sixteenth-note rhythm. Take your count of 1 and 2 and 3 and 4 and, and add an e (pronounced “ee”) after the number and an a (pronounced “uh”) after the and. Keeping the count even, count 1 e and a 2 e and a 3 e and a 4 e and a. Your pace is unchanged, and you’re marching at the same speed, but the subdivision of the beats gives you variety. You may want to try this exercise with your metronome. Keep the tempo reasonable (between 60 and 80) until you get used to it. First try marching your feet to the clicks of the metronome and tapping out the subdivisions for the eighth and then the sixteenth notes with your hand. When you’re comfortable with this exercise, try playing the subdivisions on your bass. The half note is half as fast as the quarter note. In other words, two quarter notes fill the space of one half note. If you’re still marching, tap your hand once for every two steps you take. You’re still moving at the same speed, but your rhythm is now only half as fast. The whole note is half as fast as the half note, and four times slower than the quarter note. If you’re still marching, tap your hand once for every four steps you take. As always, your speed doesn’t change; the rhythm of your hand is the only thing that changes. All the subdivisions of the notes above are either double or half and can be divided by two. In many tunes, however, the beats are subdivided into three parts, which introduces the triplet. A triplet rhythm subdivides the beat into three even rhythmic intervals. As you continue to march your way across the globe, tap your hand three times evenly for each step you take. Your step still represents the quarter note, but your hand is now tapping three notes for each quarter note. You call these eighth-note triplets. The dot is a notational device that allows you to extend the value (duration) of a note by half of its original value. The quarter note, for example, has a value of two eighth notes. When you add a dot to a quarter note, you add one extra eighth note to its value, and you end up with a note that has a value of three eighth notes. The tie combines two notes. For example, if you tie a quarter note to another quarter note, you increase the length of the original quarter note by another quarter note. However, you don’t restrike the second note. The tie simply adds the two notes together. You don’t have to play a note on every single beat. Many beats are silent. The rest tells you when to be silent and avoid playing. It works exactly like the other rhythmic notations (including the dot) except that you don’t make a sound. Check this out to hear the values of notes and rests and their typical application. In place of each rest, the word “rest” is spoken.